Midge Magic™ and Tick Magic™ are natural products that will help you enjoy being outdoors. 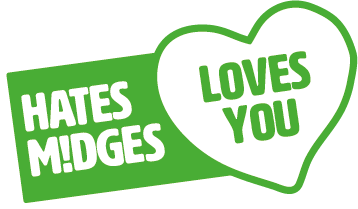 Our products are made in Scotland, from 100% natural ingredients, with absolutely definitely no DEET or chemicals. 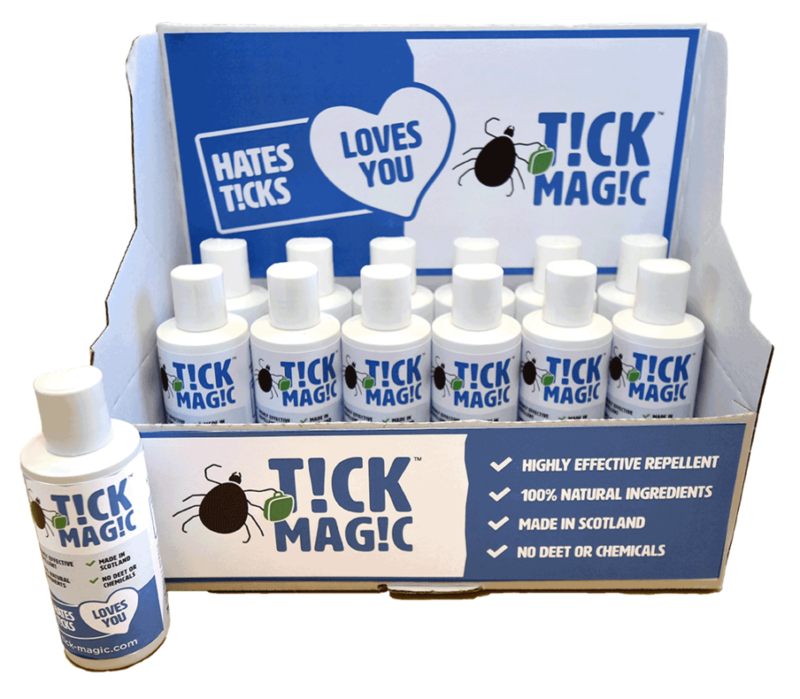 You can buy Midge Magic™ and Tick Magic™ online, or at retailers across the UK. 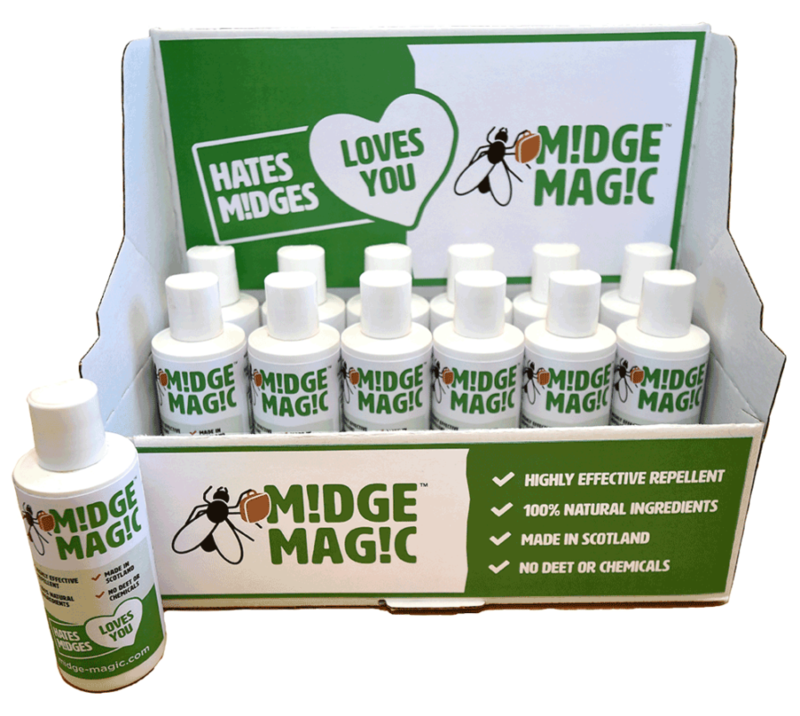 Retailers – If you’d like to stock Midge Magic™ or Tick Magic™, please call us. We ship product with an easy-to-use and eye-catching Point Of Sale display. Midge Magic™ main active ingredient is Citriodiol, a version of PMD derived from lemon eucalyptus. (PMD is the single most effective natural insect repellent). We also include small amounts of traditional repellents Bog Myrtle Oil, and Lemongrass Oil. We mix these three active ingredients with natural skin lotion and grape seed oil, which are both good for your skin. Midge Magic™ will let you enjoy the outdoors without midge bites, and keep your skin feeling soft. Tick Magic™ main active ingredient is Citriodiol, a version of PMD derived from lemon eucalyptus. (PMD is the single most effective natural insect repellent). We also include small amounts of traditional repellents Bog Myrtle Oil, and Lemongrass Oil. We mix these three active ingredients with natural skin lotion and grape seed oil, which are both good for your skin. Tick Magic™ will let you enjoy the outdoors without tick bites, and keep your skin feeling soft. If you would like to stock Midge Magic™ or Tick Magic™ in your store, please contact us. Midge Solutions is a Scottish family business, run by people who have worked and enjoy being out-and-about in Scotland, but HATE midges and other biting things. We wanted to do more outdoors, but also needed to make sure that we were using natural products. We hope that you find Midge Magic™ and Tick Magic™ effective and we’d love to hear how you’ve got on. Please do pop up your images on Facebook or Instagram, or we’re happy to have a chat.